The Federal Reserve (Fed) targets 2 percent inflation and full employment. While this sounds benign, it is part of an inefficient and unfair economic system that leads to waste, and to boom and bust cycles. The famous goal of 2 to 3 percent inflation targeted by the Fed is supposed to be a sign of a growing economy and healthy demand by households and businesses. Because both sectors earn more, they can spend more, which leads to higher prices. This is sometimes true, but most of the time inflation is a hidden tax on productive businesses and households that rewards the government and financial speculators. Price inflation arises when there is too much money chasing too few goods. For example, the broader money supply figure called M2, which includes most bank deposits, has multiplied 46.5 times since the beginning of 1959, the first time the data was recorded. GDP, not adjusted for inflation, only went up 38.1 times, so the money supply grew faster than productive output. Simply holding U.S. dollars will lead to a guaranteed loss of purchasing power. Over the same time, every dollar spent by the average U.S. consumer lost 88 percent of its purchasing power. This is not a coincidence. Proponents of inflation economics, mostly followers of the Keynesian school, say that this does not matter, as wages rise in proportion to the loss in purchasing power. If all prices in the economy indeed rose by the same proportion, then the whole notion of inflation would become meaningless, as relative prices would stay the same. In practice we find that persistent inflation puts wage earners at a disadvantage; wages have only gone up 33.5 times during the period since 1959. It also penalizes savers who forgo consumption to prepare for retirement or for the purchases of larger items like a house or a car. Simply putting the money under the mattress or having it in a low yielding deposit at the bank just won’t do. This means that everyone who wants to protect their savings must become a financial speculator, as simply holding U.S. dollars will lead to a guaranteed loss of purchasing power. Partially due to this incentive, and to the relatively large number of stockholders among the U.S. population, the stock market increased roughly in line with the broad money supply, as the S&P 500 index has gone up 45.5 times since 1959. Different financial instruments, such as time deposits, bonds, real estate, or stocks, can produce a return higher than that of the inflation rate, but they also involve risk. Inflation, therefore, eliminates riskless saving, an otherwise normal feature of holding monetary instruments such as gold. Another winner in this system is the government. This is because the money supply (M2) is often inflated by using government bonds that either the Fed or banks buy with freshly printed money. In fact, government debt has gone up a staggering 70 times since 1959—more than any other metric—in part because foreign entities also hold a large chunk of it. The government’s gains from inflationary policy are manifold. First, inflation erodes the interest the government pays on its debt in real terms. Right now, with inflation ranging between 2 and 3 percent and the 10-year treasury yield between 2 and 3 percent, the actual yield is zero. The government taxes nominal GDP, which increases with gains in productivity and inflation. Having a higher nominal GDP means higher taxes, which makes it easier to service the debt. So any gain in wages or even capital gains from the stock market, which would reduce the impact of inflation, are reduced by progressive taxation. The government and financial speculators such as banks benefit from the increase in the money supply because they get the fresh money first. Once a bank buys a government bond with new money—all it needs to do is expand its balance sheet—the government can use the new money it has on deposit with the commercial bank to fund its operations, like welfare transfers or its massive bureaucracy. Because it gets to spend the money first, it gets the prevailing prices before the market can adjust for the increase in the money supply. As the money trickles down through the economy, reaching wage earners and businesses who don’t supply the government, prices adjust upward. This is the hidden tax of inflation the private sector doesn’t know about. The fact that banks can print fresh money to buy practically risk-free government bonds explains why the government has resorted to increases in debt to fund uneconomical ventures like wars or the welfare state. It’s better than increasing tax rates directly, which would lead to social upheaval. Instead, the government just has to wait until inflation works its way through the economy and increases nominal GDP because of higher prices. Then the existing tax rates bring in more tax revenue without anybody noticing. Banks also benefit because they can sell the freshly issued government bonds to pension funds and other institutional investors and use the new money to put it into the stock market, real estate, or commodities before anybody else, also getting cheaper prices before other market participants. Purchasing Power of the US Dollar for the Average Consumer 1959-2017: Since 1959, the dollar lost 88% of its purchasing power thanks to inflation. 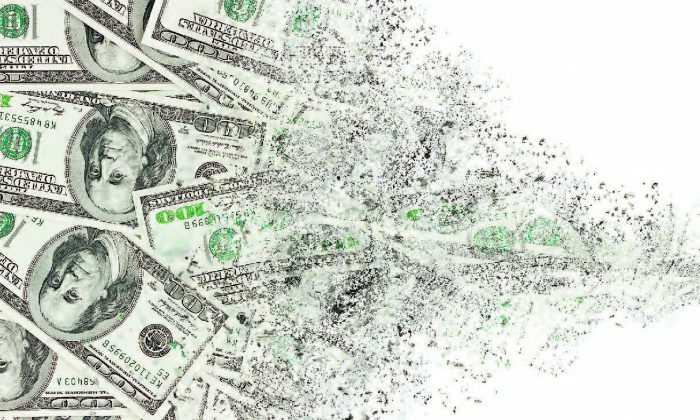 In the United States, this erosion of the value of the dollar has been gradual and only noticeable over time because there have been powerful deflationary forces increasing the supply of goods and therefore cushioning the impact of inflation. The most important factor is gains in productivity through technological advancement. The IT revolution has made it possible to produce more with less, providing us with ever cheaper gadgets, cars, plane tickets, and so on. Where the private sector and competition are allowed to work unabetted, prices usually decline, which is what should happen naturally in a market-based economy with stable money. 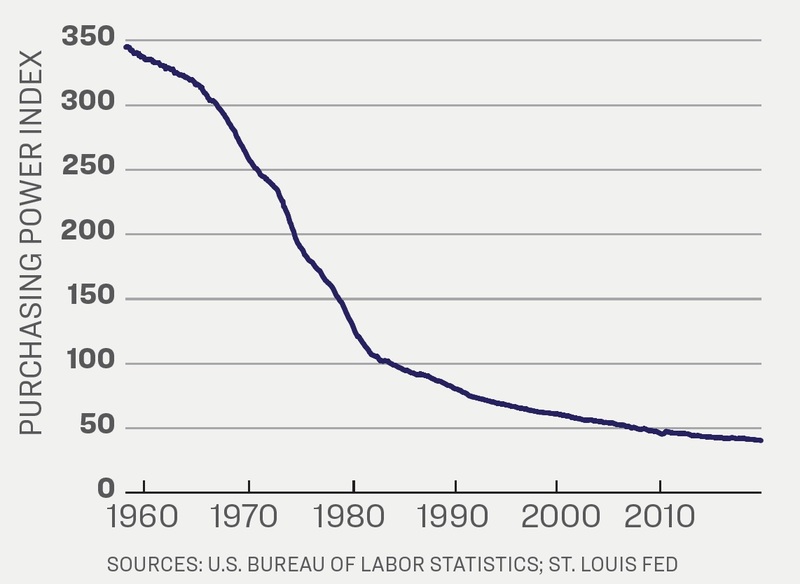 Non-farm productivity has grown 220 percent since 1959. So we have innovation and declining prices in sectors with little government interference, countering the inflation of the sectors where the government is heavily involved, leading to an overall mixed picture. The second factor leading to goods deflation was the increase in productive capacity in foreign markets, especially China. Cheaper foreign labor and capital enabled the opening of huge industrial capacity and the production of sometimes artificially cheap goods, sold to the U.S. market. In the absence of these counterbalancing factors, monetary inflation eventually leads to a complete breakdown of the currency, as can be seen in Zimbabwe and Venezuela at the moment. Both countries have a booming stock market, but only in nominal terms. An economy under a stable monetary regime like the gold standard would display naturally deflationary tendencies that would benefit wage earners and savers. Capital investment would be financed out of real savings and not via the creation of new money in the banking systems. The fact that banks can print fresh money to buy practically riskfree government bonds explains why the government has resorted to increases in debt to fund uneconomical ventures like wars or the welfare state. This investment would lead to increases in productivity, enabling the economy to produce more with less, thereby lowering commodity input prices and output prices of consumer and capital goods without affecting wages negatively. The purchasing power of consumers would, therefore, rise every year, and savers could choose to save a share of their disposable income in cash or at a bank without even receiving any interest. Investors with a higher risk appetite could still choose to deploy their savings in riskier ventures to fund capital investment, but they would not be forced to, as is the case now. The Fed and other central banks are afraid of deflation because they know it would take the form of forced selling of leveraged assets, as happened during the subprime crisis. But benign deflation in a stable money system originates from gains in productivity higher than the prevailing interest rate for loans. As for the government, it would have to learn to live within its means, as it could not rely on banks to print money to finance its debt. And with money increasing in purchasing power and being literally risk-free, it would be hard-pressed to find investors to buy its bonds. With less financial speculation and less government waste, capital could find the most productive uses, leading to higher productivity and, ultimately, cheaper consumer prices. And who wouldn’t like that? 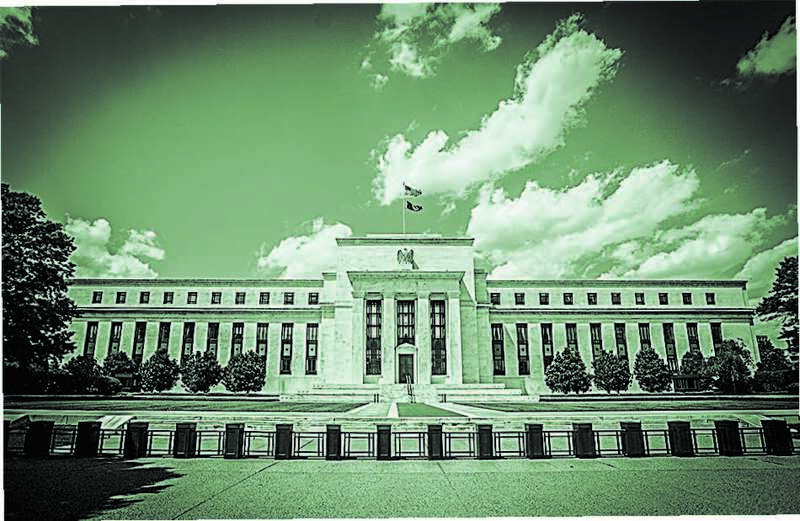 This article is part of a special Epoch Times series on the Federal Reserve. Click here to see all articles. Who Is the Fed’s Powell and What Is His Strategy?